In the Battle for the Pacific Division, there can only be one victor. The San Jose Sharks, Dallas Stars, Phoenix Coyotes, and Los Angeles Kings have been engaging in playoff-caliber hockey for over a month. The teams have rarely been separated by more than a point or two in the standings during that time, making every single game crucial. Dallas’ loss to Nashville on Thursday night officially knocked them out of playoff contention, leaving the remaining three teams to fight for seeding. The Pacific winner will catapult up to the 3-seed in the West and gain home-ice advantage while the others will be left to face powerhouses in Vancouver and St. Louis during the first round. There’s a lot on the line. In a wild, rough-and-tumble affair that featured seven power play goals, three fights, a boarding major and three roughing penalties, the San Jose Sharkcame back from a 3-1 second period deficit to outlast the Los Angeles Kings, 6-5 in the shootout. The sneaky move went unnoticed by the referees and kept the score tied before the Sharks eventually prevailed in a shootout. 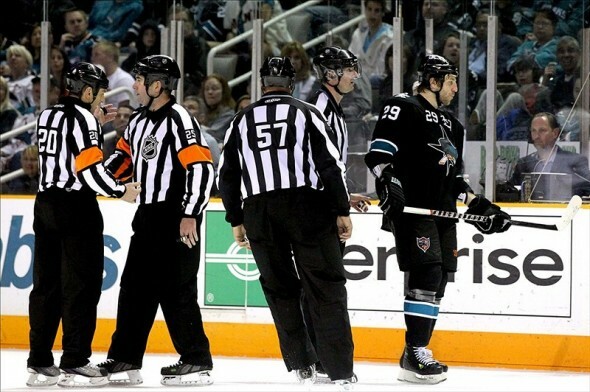 A minor penalty shall be imposed on any identifiable player on the players’ bench or penalty bench who, by means of his stick or his body, interferes with the movements of the puck or any opponent on the ice during the progress of the play. In addition, should a player about to come onto the ice, play the puck while one or both skates are still on the players’ or penalty bench, a minor penalty for interference shall be assessed. 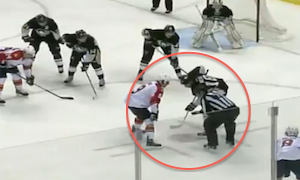 The call on the ice would’ve been officially a two-minute minor penalty for Interference. This rule rarely comes into play, but it’s actually not the first time it’s been called this week. 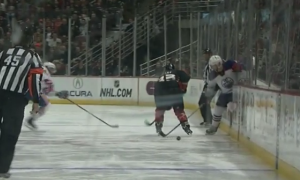 Nick Schultz and the Edmonton Oilers thought the referees were playing an April Fools joke on them Monday night when Schultz was given a penalty for playing the puck before fully exiting the penalty box. This situation happens once or twice a year, but it’s just a matter of timing and overanxious players. Clowe’s tactic was blatant and intentional. He didn’t hurt a star player with a vicious elbow, but he potentially had a substantial impact on the game and the teams involved. If the Kings had scored on the odd-man rush and won the game, the Sharks would have been eliminated from division title contention. 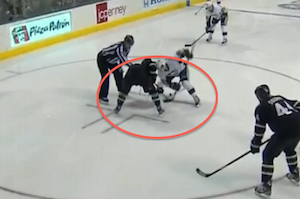 It’s disappointing that four on-ice officials failed to see an infraction that occurred in plain sight. But what about Clowe? Was his move cheating or just another example of the gamesmanship that occurs on and off the ice every night yet goes unnoticed by most? Sand from the beaches of Montreal somehow made it into the hallway outside the Philadelphia Flyers locker room a few years back. The Detroit Red Wings were notorious for painting the visiting team’s locker room at Joe Louis Arena just hours before a playoff opponent arrived. Holes in the rubber mats on the away bench at Pittsburgh’s Civic Arena left skate-dulling screws and bolts exposed. Even faceoffs are carefully corrupted by savvy players and coaches looking for an edge. Veteran goalies unstrap their equipment just enough to delay a faceoff after an icing call to get their teammates some rest. Coaches abandon common sense, act confused, and insist on a twenty-second referee explanation for the same reason. There’s even growing trend of players getting intentionally thrown out of faceoffs to stall and get a breather. A few weeks ago, the Dallas Stars iced the puck against the Pittsburgh Penguins at a crucial point late in the second period. 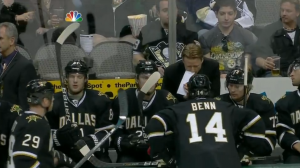 Sure enough, the Stars did use their timeout and Gulutzan pulled Jamie Benn aside to whisper a few directions. When the two teams eventually congregated for the faceoff in the Stars’ defensive end, it was left winger Benn and not Steve Ott lined up to take the draw. Benn takes a number of faceoffs for the Stars but his 46-percent success rate can’t compare to Ott, who ranks among the Top 15 in the NHL. Benn had no intentions of taking the faceoff though. Before the referee had a chance to drop the puck, Benn slashed the stick of Pittsburgh’s Joe Vitale resulting in a faceoff violation. After being thrown out of the draw, Benn slowly wandered away from the faceoff dot and in came the ace Steve Ott to handle his normal duties. Ten days later the Penguins found themselves in a similar position against the Florida Panthers. With a tired unit stuck on the ice after an icing call, right winger James Neal — with all of 15 faceoffs and a gruesome 26-percent success rate on his resume this season — stepped in to take the critical defensive zone draw. Neal refused to put his stick on the ice, slid his skate onto the faceoff dot to make his infraction obvious, and was thrown out. In came center Evgeni Malkin after an extra fifteen second rest. These minor incidents happen every single night in the NHL. Many players even argue ‘if you aren’t cheating, you aren’t trying’. Over the course of a playoff series, the tiny psychological and tactical advantages can be the difference between winning and losing. Fans and writers around the country are shocked that Ryan Clowe made the “stupid” decision to stop the puck with his stick from the bench and risk a penalty. But how stupid was it? It prevented a scoring chance and allowed the Sharks to stay alive in the Pacific Division race. Is it any different than tackling a player in front of the net to prevent a goal? Or pumping paint fumes into a locker room? Or sending a winger into the faceoff to get intentionally kicked out and delay the game? Envision Sidney Crosby on a breakaway in overtime of Game 7. If there’s no chance of fine or suspension and only the possibility of a two-minute minor penalty, why not send an extra player on the ice to stop him? Where should the line be drawn? Leave us your take in the comments.